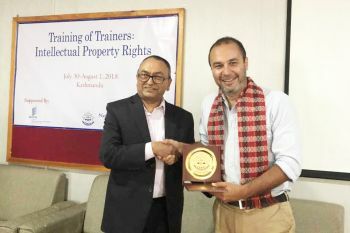 Dr Enrico Bonadio trains Nepal's most senior judges on a programme organised by the World Intellectual Property Organisation. From July 30th to August 1st, Senior Lecturer and intellectual property specialist in the City Law School, Dr Enrico Bonadio, trained Supreme and High Court judges in Kathmandu, Nepal. Titled, "Training of Trainers: Training Intellectual Property Rights for Judges", the programme was aimed at assisting the National Judicial Academy of Nepal with a view to making it more efficient in enhancing the capacity of judges in the area of intellectual property and providing local trainers with the necessary knowledge and skills to later train judges. The programme was organised by the World Intellectual Property Organisation, an agency of the United Nations.